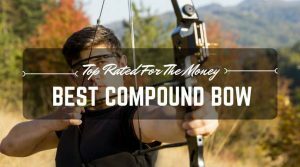 When it comes time to choose whether to buy a recurve bow or a compound bow, there are several differences to consider. They both shoot arrows at intense speeds due to tension in a string. They can both be used for hunting and for target practice, but similarities end there. 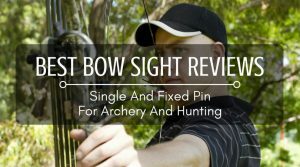 The differences are what make each the recurve bow and the compound bow exciting in their own unique ways. The bodies of the bows are quite different. The recurve bow is looks like a traditional bow that has been used for centuries. The bow is curved and the string stays taut between the ends of the bow. As the string is drawn back, the bow enters into a deeper curve. Most recurve bows are made of wood because of the flexibility. The newest recurve bows are made of flexible manufactured materials, like carbon or fiberglass. 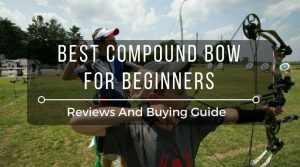 The compound bow also has a string and a bow, but so much more. The compound bow uses pulleys and strings to create the tension that the bow needs to fire the arrow. The bow itself is usually made of manufactured materials, usually either carbon or aluminum. The bow is made of different pieces including the grip and the limbs, which attach to the pulleys and the strings. 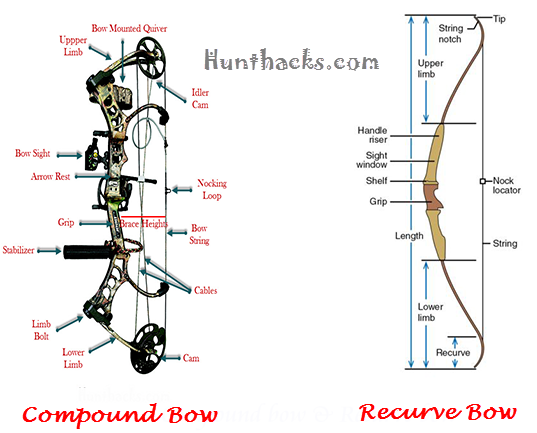 A compound bow body is smaller than the recurve body. When it comes to accuracy, the compound bow has more than the recurve. The bow strings are longer than those of the recurve, so they can be pulled farther back for a more powerful release. The accuracy also improves over the recurve bow because the pulleys make it easier to hold in the pulled back position. This allows the user to aim and fire without having to use strength to hold the arrow back. Compound bows are also more accurate due to the fact that they often come with sights. Recurve bows can have sights added, but they often upset the balance of the bow. With a sight, the shooter can easily find the target and get an accurate shot off without missing a beat. With a recurve bow, the shooter needs to rely completely on the naked eye. 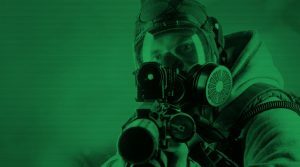 At a distance, this can be challenging, especially if light is dim or there is fog. With a recurve bow, the shooter needs to use his own strength. If the string needs to be held for a long time, the muscles can quiver, which alters the direction of the arrow thus compromising the accuracy. The limited strength needed to fire the compound bow makes it a better tool for hunting because it is easier to wait for the perfect shot. But, when it comes to target practice, the recurve bow is a better choice. Being able to shoot this bow accurately is a skill that is difficult to do. Since shooting at a target does not require the shooter to hold the arrow back for a long time like shooting at an animal, accuracy is easier to achieve. The recurve bow is significantly lighter than a compound bow. Since recurve bows are so simple, they are lightweight. Since compound bows have so many parts and accessories, their weight can increase quickly. 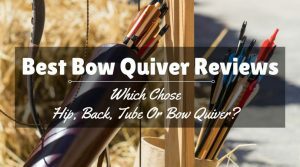 If hunters are going to carry a bow around all day while hunting, the recurve bow is a perfect choice. Since many hunters prefer compound bows, manufacturers have made it easy to put straps on for easy carrying. The power that comes from the recurve bow is also less than the compound bow. The pulleys and other machine parts make the bow fire harder and faster than the traditional bow. Because the compound bow shoots so powerfully, it is much easier to use heavier arrows that will make an impact on the game that are shot. There is a big difference in shooting the bows. The traditional, recurve bow actually requires practice because it requires skill to hit a target. The compound bow does not require as much skill, because they have so many accessories and tools to make the shot on target. The compound bow is not as fun to shoot, because it is so mechanical. Some compound bows jerk when the string is pulled back. The weight of the bow shifts slightly to compensate for the mechanics. The traditional bow does not have any jerkiness to it. The smooth pull and the quick release makes them pure fun to shoot. 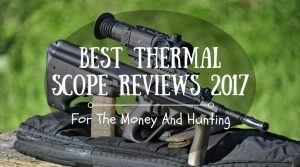 The quiet power of the recurve is empowering for the shooter. The compound bow does not offer the same feeling – despite the immense power released when the arrow is let go. 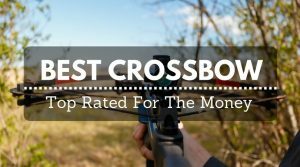 Sometimes, a compound bow can actually be uncomfortable to shoot, especially the ones that are older and not so precisely crafted. 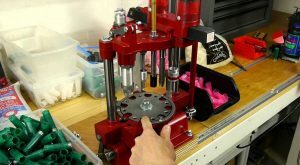 Before selecting the perfect bow for your needs, it is a good idea to consider your shooting needs. A good bow is an investment, so it is wise to conduct thorough research.